Surely never by those vehicles would one go to the untrodden land (Nibbana) as does one who is controlled through his subdued and well-trained self. SIL: The word 'Sil' is a Sinhala word. It is derived from the Pali word 'Seela'. 'Pali' is the language that was spoken by the Buddha. The Buddha used the word Seela to mean good conduct or virtue. Good conduct leads to good character. Hence Seela means both good conduct and good character. When you practise good habits and virtues you develop good character. All Buddhists try to observe Pancha Seela or the Five Precepts. Very often, both young and old recite the Five Precepts daily. The five precepts refer to: 1. Respect for life of all living beings, 2. Respect for other people's property and possessions and not to steal anything, 3. Avoid sexual misconduct, 4. Respect for honesty in word and deed and 5. Keeping away from the use of alcohol and drugs. These are very well-known and do not need any detail description. Generally, these Five Precepts refer to offences in many societies and most people look down upon violation of these. Many people in most Buddhist countries observe Sil or Ata Sil on Poya Days. A Poya Day (Uposatha) represents a phase of the moon. The four phases of the moon that occur in approximately one month are the new moon, first quarter, full moon and last quarter. In most Buddhist countries people usually observe Ata Sil or Eight Precepts for twenty-four hours at a time. That is from dawn to dawn. But in non-Buddhist countries like the US we try to observe the Eight Precepts or Ata Sil once a month for at least eight hours. Usually we have Sil observance on fullmoon days. Ata Sil includes eight precepts. The addition of three more precepts to the set of five (Pancha-Sila) and making it the Eightfold code for observance gives great elevation for spiritual progress. Let us examine this spiritual development a little more in detail. The five precepts clearly aim at preventing people from committing misdeeds through word and deed that are harmful to others. The additional three precepts aim at self discipline or spiritual advancement of one's self. In their order, the additional three precepts are as follows: (a) Not taking of normal meals such as a solid food after mid-day. This is of course limited use of fasting. Every religion has some sort of fasting. It promotes relaxation and energising of body. Fasting clearly improves motivation and creative energy. It also enhances health and vitality and lets many of the body systems rest. (b) Keep away from customary musical and theatrical entertainment and personal bodily grooming, (c) Avoid use of extra-comfortable luxury-type beds and seats which are normally used in the household. The third precept of Pan Sil is also extended to include observing celibacy. All these mean a choice in the direction of austerity and sacrifice. What is to be specially noted is that they involved a self discipline while the Five Precepts are more directed towards respect for others. More importantly when you observe Ata Sil, you have the opportunity to practice meditation and also devote time to attain wisdom. This will lead to the way Buddha showed to achieve complete happiness. Many of his disciples during his time and later followed this path and attained complete happiness - Nirvana. The Buddha presented His teaching in the form of a gradual training. It requires gradual practice and gradual attainment. The Buddha laid down three stages for this attainment. They are (1) Training in Sila or virtue, 2. Training in Samadhi or concentration, 3. Training in Panna or wisdom. For any training and practice you first need faith and confidence which is called Saddha in Buddhism. For the training in these three stages too, you first need faith and confidence or Saddha. These three stages take time to train and develop. It is not something that can be achieved all of a sudden. It has been compared to a tree. A big tree with a strong trunk and several branches does not arise all of a sudden. It does not grow overnight. It grows over a long period of time gradually in stages. In the comparison to the tree, Saddha can be compared to the seed. First, the seed will start to germinate or grow. It grows gradually. Seela or virtue would be the roots. Just as the roots give grounding to a tree, Seela or virtue gives grounding to our character. Concentration or Samadhi would be the trunk. It is the symbol of strength. It gives stability. It prevents the tree from vacillating or becoming unsteady. Wisdom or Panna would be the branches. The branches would yield flowers of Enlightenment and the fruits of Nirvana - the ultimate happiness. When we observe Sil, even for a few hours on a given day, we try to practice all these aspects. When we practice these three aspects we lay a foundation for gradual progress towards the ultimate goal - Nirvana. The 95th birth anniversary of Meegomuve Jinawansa Nayaka Thera who radiated the light of Dhamma in Negombo called the 'Little Rome' falls on January 25, 2007. Ven. Meegomuve Sumedha Tissa Thera, the incumbent of Abhayasekeraramaya, Negombo and the Dayaka Sabha of the Temple have organised a series of Pinkamas for the occasion. The well-known Buddhist prelate, preacher of Bana, writer, poet and social reformer, Meegomuve Jinawansa Thera has contributed in no small measure for the Buddhist resurgence in Negombo. Ven. 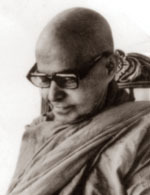 Meegomuve Jinawansa Thera was born at Thimbirigaskatuwa in Negombo on January 25, 1912. He entered Buddha Sasana at the age of 12 as a pupile of Madampe Aggavansa Thera, the then incumbent of Abhayasekeraramaya Temple, Negombo. As a Samanera, Jinawansa Thera had his early education at Vidyabandhu Pirivena, Kirimetiyana under Pindapathika Saddhammalankara Thera, the Maha Nayaka of Amarapura Mula Vansa Nikaya. In 1931, he joined Vidyodaya Pirivena for higher education. He passed out from Vidyodaya in Pundit finals with honours in Pali and Sanskrit. After completing his studies, he returned to his native temple Abhayasekeraramaya, Negombo. As a young Bhikku he took a leading role in all the religious and cultural activities in Negombo. During his time Abhayasekeraramaya was a hive of spiritual and social activity. Meegomuve Jinawansa Thera set up Susilodaya Sunday Dhamma School in Negombo and was its head for 40 years. He was the patron of Negombo Sadachara Vardana Samithiya and played a leading role to establish the Bauddha Mandiraya in the heart of the city overcoming many obstacles. He initiated the formation of Bauddha Kulangana Samithiya in Negombo. It was Meegomuve Jinawansa Thera who organised Buddhist associations in Negombo hospital and Negombo prisons. He took the lead to establish the Bhikku ward in the Negombo hospital. He encouraged the formation of Negombo Buddhist Lawyers' Association. Even Catholic lawyers participated in philosophical discussions conducted in this society by Meegomuve Jinawansa Thera. In 1961, Ven. Madampe Aggavansa Thera passed away and Meegomuve Jinawansa Thera succeeded him as the incumbent of Abhayasekeraramaya Temple in Negombo. It was Jinawansa Nayaka Thera who built the beautiful Chaithaya at Abhayasekararamaya. Meegomuve Jinawansa Nayaka Thera converted Abhayasekeraramaya to a seat of higher studies. Many Buddhists and non-Buddhists including Catholic clergy came to the Temple to study Pali and Sanskrit under Meegomuve Jinawansa Nayaka Thera. Ven. Meegomuve Jinawansa Thera was a well-know preacher of Bana. He was much in demand all over the country for his erudite sermons. He also preached Bana through the SLBC. He taught Buddhism for higher classes at Harischandra Vidyalaya, Negombo without any remuneration. He was also a poet and author of several books. His works 'Bahkthi Malinee' and 'Sanvega Malinee' present Buddhist philosophy in simple verses. Poems from 'Bhakthi Malinee' were often recited in the Bosath Lama Lapatiyo programme in the SLBC. Some verses in 'Sanvega Malinee' contained so much pathos, they were recited with those of 'Vessantara Jathakaya' at nights at funeral houses in Negombo. The well-known poet Wimalendra Waturegama has remarked that in language and in style Meegomuve Jinawansa Thera came close to Vattave Thera of Guttilaya fame. He also presented 'Bauddha Gedera' and 'Saranamalee' in prose exalting Buddhist way of life and culture. Dr. E. R. Wijerama was so taken up by the work of Meegomuve Jinawansa Thera, he and his wife built a temple in a plot of land in Kadirana and donated it to Jinawansa Nayaka Thera. This is the present Wijeramaya Temple at Kadirana. The Buddhists in Kochchikade in the outskirts of Negombo were in dire need of a temple for their religious activities. Ven. Meegomuve Jinawansa Nayaka Thera with the assistance of businessmen there established Sri Saddharmodaya Vihare, Kochchikade. Meegomuve Jinawansa Thera was a sympathiser of the SLFP and he was close to the party hierarchy. However he was not a political activist and he never gave a political dimension to religion. He worked with all and sundry irrespective of their political convictions of the progress of mankind. Meegomuve Jinawansa Thera always came to the forefront on national issues. In 1944, when Dr. C. W. W. Kannangara presented the Free Education Bill, he was opposed by vested interests. In this endeavour Dr. C. W. W. Kannangara was ably backed by the progressive Bhikkus centered round Vidyalankara Pirivena. Meegomuve Jinawansa Thera who was a young Bhikku at the time joined them and campaigned for free education. In 1956, Meegomuve Jinawansa Thera threw all his weight to bring about a national awakening that led to the victory of the MEP. 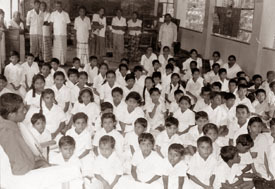 In 1960 he campaigned for the Schools Take Over and mobilised both Catholics and non-Catholics in Negombo and the vicinity in favour of the move. Though Meegomuve Jinawansa Thera fought for religious and cultural rights of the Buddhists, humanism was his policy and he believed in the rights of others. He was deeply interested in Buddhist-Christian friendship which made him a popular and venerated personality among the Catholics. For over a decade he was a patron of Meegomuve Janatha Balavegaya, an organisation set up by Catholic clergy in Negombo. That is not all. For over 20 years Meegomuve Jinawansa Nayakaya Thera was the secretary of the Pradeshiya Sasanaraksaka Mandalaya in the area. He was also a joint secretary of the Three Nikaya Sangha Sabah of the Negombo division. At the time of his death, he was the Nayaka Thera of the Negombo division of the Amarapura Mula Vamsa Nikaya. I am very fortunate to have been influenced by Meegomuve Jinawansa Nayaka Thera in moulding my life and career. Being a Catholic from Negombo, educated allthroughout in Catholic schools, how could I be so inspired by a Buddhist bhikkhu - Meegomuve Jinawansa Thera? In my formative years, I studied Sinhala for the University Entrance class at the feet of Meegomuve Jinawansa Thera. It was a treat for me to listen to Jinawansa Thera explaining the intricacies of ancient Sinhala classics and his expositions of graceful splendour in the text books "Pujavaliya' and 'Guttlilaya'. He trained me to absorb the beauty of Sinhala language and niceties of our rich heritage and culture. I had lively discussions with Meegomuve Jinawansa Thera and he made me to go deep into Buddhist philosophy, He guided me to appreciate Buddhist way of life and its simple and serene culture. In our final year at the Peradeniya University we were perturbed as the students of the previous batch who left the University and who did special courses in Economics, Sociology and Philosophy were not given government teaching appointments. As graduands of Vidyodaya and Vidyalankara Universities too were to be passed out for the first time with our batch, we were in a quandary whether we too would get teaching appointments. As such I too was agitated. When I visited Meegomuve Jinawansa Thera during the holidays, I expressed my fears to him. Meegomuve Jinawansa Thera admonished me to study hard for the final examination without worrying about the future. He gave me to read the book 'Live Now' that contained the expositions of the Buddha on the matter. Because of the discourse of Meegomuve Jinawansa Thera my uneasiness allayed and I could study for the finals without tension. Later I got a teaching appointment, studied law, became a lawyer and ended up in the Judiciary. If I did not get the appropriate advice of Meegamuve Jinawansa Thera at the crucial time, I would have fallen on way. When I passed out as an Advocate in 1971, the first public speech I made was at the insistance of Meegomuve Jinawansa Thera. He got me to make the keynote address on S. W. R. D. Bandaranaike at a well attended commemoration meeting he organised at Abhayasekeraramaya, Negombo. When Meegomuve Jinawansa Thera passed away on October 11, 1981 I was serving as the Magistrate, Nawalapitiya. I came from Nawalapitiya to attend his funeral and I was surprised to see the large crowd at the cremation of Buddhist prelate in Catholic Negombo. That was the largest gathering I have seen at the funeral of any religious dignitary in Negombo. I have no doubt that that the majority found there were Catholics. That unprecedented crowd speaks volumes for the high esteem the people had for Meegomuve Jinawansa Nayaka Thera. If you are living in a town or city, you can still practice inclining the mind to nature. As you take a walk in the city, notice the presence of the natural world- the sky above and between buildings, the movement of wind, the scent in the air, the presence of clouds or gentle rain. Notice the moss that clings to buildings, how grasses push their way through cracks in pavement, or the way trees cast shadows across sidewalks. Take time to feel the warmth of the sun on your skin and know the movement of the moon. Most importantly, observe what happens within when you pay more attention to the nature that is all around you.